As a long-time stamp collector I have been asked some funny questions over the years such as “does Rite Aid sell stamps?” or “where can I buy stamps?” which has nothing to do with stamp collecting whatsoever. Recently however one of my friends asked if vintage stamps are still valid to send letters which reminded me of something I use to do to make letters a little more personalized. So I thought I would spend some time showing you some unique ways to add some character to your letters. A quick note: before you use vintage stamps, make sure they are on the allowed list. The United States Postal Service (USPS) maintains guidelines related to the validity of stamps. You can check what you have against the Domestic Mail Manual (DMM), which is available to view here from the USPS. 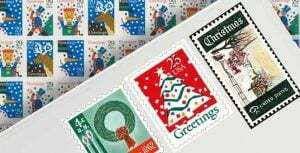 As long as your stamps meet the requirements and are not listed on the prohibited postage list, you are ready to start mailing! Friends are an important part of every stage of life. As you get older, you’ll recall those fond times from years’ past. It can be a pleasant experience to take a moment and sit down with pen and paper to write out a letter to a friend. There’s something nostalgic about doing it by hand rather than by keyboard. When you’re done, put in an envelope and attach a vintage stamp. This will be the first thing your friend will see when they receive the letter, which will set the tone for a good read while thinking about good times! No matter how large or small your family is, you probably have gatherings once in a while. Holidays are a popular time for get-togethers. They are also a great time to use affordable vintage postage stamps. Try to find something that matches the holiday. Christmas designs come in all colors and styles, but there are also plenty available for other holidays like the 4th of July and Easter. Look for something that the oldest generation will really appreciate. You may be surprised to learn how many family members end up keeping the envelope because they loved the old stamp! Small details can make a huge difference, especially when sending a meaningful message. If you’re writing a letter or mailing a card, choose postage that matches the occasion or sentiment. For example, if you’re sending a card to congratulate new parents on the birth of a baby, look for something with a vintage stroller or stork design. If you’re writing a note of encouragement to a friend who is having a tough time, look for vintage stamps with upbeat themes and bright colors. Flowers, scenery, and animals are a great choice. A lot of time and money goes into planning a wedding. If you love retro or traditional styles, then vintage stamps are a must. The invitation should match the theme of the event. If you’re having an old English tea party style wedding, look for vintage stamps featuring flowers or tea cups. You can also find designs by decade to go with a period-specific wedding theme. This approach also works well for destination weddings. Are you heading off to Hawaii for your nuptials? Look for a Hawaiian vintage stamp. Planning a bridal getaway in the mountains? There are many old designs featuring majestic peaks and mountain wildlife. Hobbies are a great way to bond with another person. When you share the same hobby, you have a lot more to talk about. Even if you aren’t into the same activities, you can show someone that you know them well by celebrating their hobby with a vintage stamp. Before mailing a card or letter, look for a design that matches what they love to do. Are they a gearhead with a love of trucks or cars? There are numerous styles that feature retro autos and muscle cars. Do they enjoy gardening? Look for a design featuring plants, fruit, or vegetables. Get creative with your stamps and show someone that you appreciate their hobby! Affordable vintage stamps are an easy way to send a message or invite someone to a life event or gathering. Set the mood and leave a lasting impression by choosing the right design for the occasion.